Like perhaps many of you, we have a wonderful old railroad bed that been transformed into a highly-useable public space: our rail trail/greenway system. 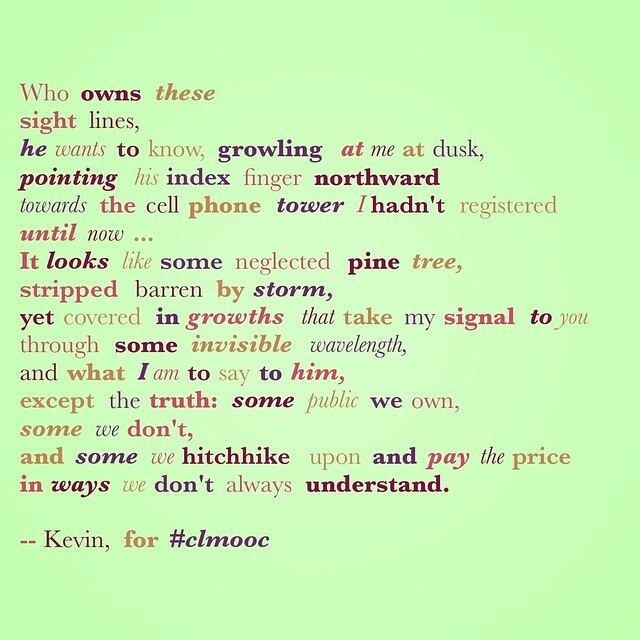 A few years back, I wrote about the trail for a local poetry compilation, and I thought this week in the Making Learning Connected MOOC would be a fine time to dust that poem off and make it into a digital poem. Twitter Chat Preview: Are You? Can You? Will You? Is it Thursday already? 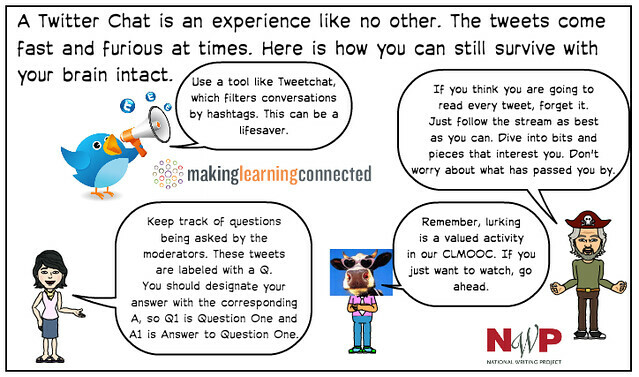 Tonight, we will be hosting a Twitter Chat for the Making Learning Connected MOOC (#clmooc) and we invite you to come along for the ride … er, discussion … as we share out thinking about open spaces and public parks and other threads from the current Make Cycle that we are in. Suggestion: use the Tweetchat site as a way to manage the flow of discussion. Haven’t gotten outdoors yet? 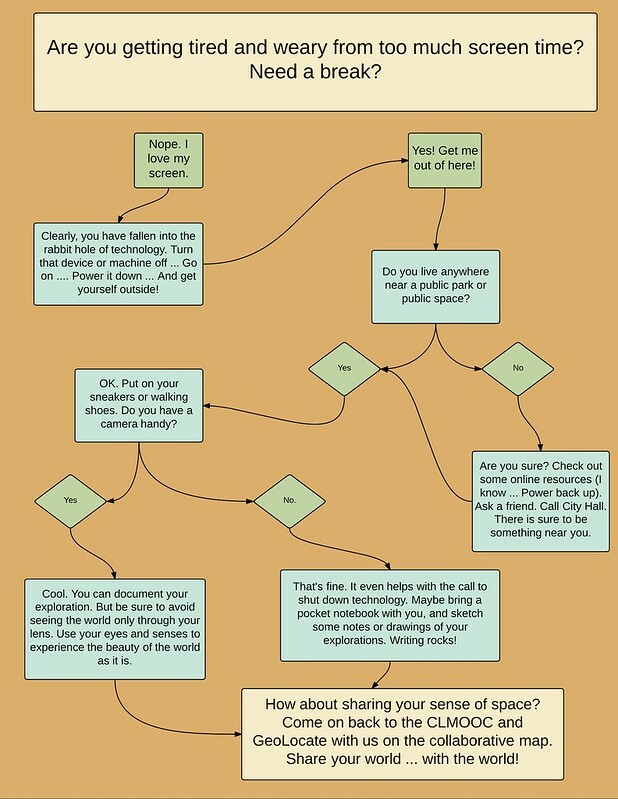 This handy flowchart might help you make that decision. I hope to see your tweets tonight! Although it is only a 30 minute drive, and new signs for the Springfield Armory dot the highway near Springfield, our urban center of Western Massachusetts, I had never visited or thought to visit, to be honest. The museum is located near the heart of Springfield, on the gated grounds of a community technical college. But this summer, our Western Massachusetts Writing Project forged a partnership with the National Park Service, thanks to a grant from the National Writing Project, and knowing that this Make Cycle on parks would be coming up, I decided to visit the Springfield Armory with some of my sons and one of their friends. I went back another day to document a youth program that our WMWP teachers were running for a week for urban middle school youths, too. I was impressed by the Armory, yet — and this is no surprise — I was taken aback by all the guns. I know. Of course, there are guns. It’s a museum at an armory, for goodness sake. Still, even so, the walls and walls, and displays, of guns of all sorts is a lot to take in, given what I teach about in my classroom and what I believe in my heart about the world. The guns sure got my son’s attention, and made me more than a little uncomfortable about our country’s legacy, even though I know it is an important part of our historical story and even though I am a former National Guardsman myself, trained to use a variety of weapons (and in that time of service, hoping I would never have to use what I was learning). But seeing all of the weapons in the Armory, and imagining how they were used to take lives and to save lives, and to affect national aspirations, and utilized at the hands of mostly-young, mostly-poor men while politicians directed wars far from the battlefront … that historical story of who is called to fight for a country all became very evident as I walked through the museum, read the displays and examined the guns. 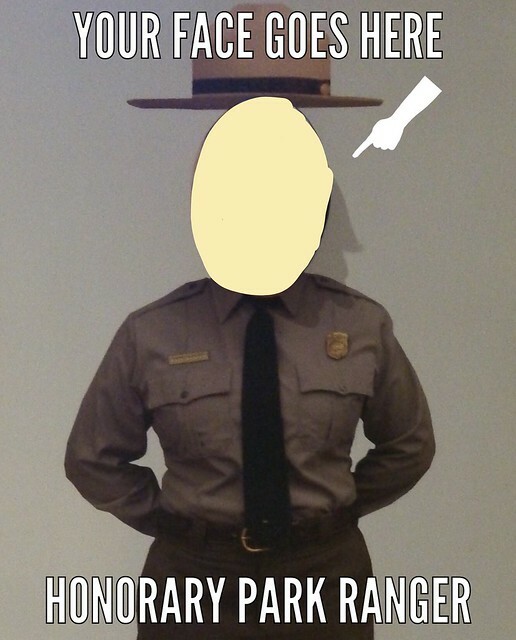 This is not the museum’s fault, of course. They have done a fine job of representing the Springfield Armory’s role in history, and an entire wing of the museum is themed on “innovation and engineering” and the ways the armory transformed the economy and manufacturing systems over time. It’s quite impressive. I do wonder, though, if teachers are apt to bring classes of students here, given the theme of weapons. I don’t know. I was very impressed, however, on how the WMWP teachers and park rangers at the Springfield Armory used that tension as a learning experience. Youths at the camp dove into a theme of social justice, and history of Springfield, and the connections to the Armory, and they wrote poems, and make comics, and constructed 3D models of Springfield, and more. What I learned myself is that history not only educates but also has the ability to create discomfort, and maybe it is through this discomfort that we come to understand our nation, and ourselves, a little bit better. 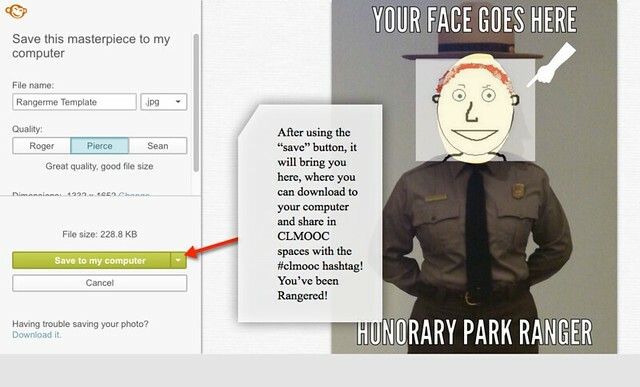 I am sure some of my CLMOOC friends would like to join in on the RangerMe impromptu make. 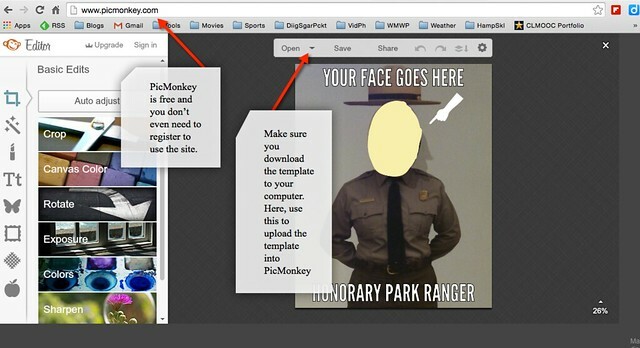 So, here is a tutorial using the free but powerful PicMonkey photo editing. I chose online so that it can cross platforms. First, you need to have the template ready for upload. Go to the photo in my Flickr account and download it. And be sure to share out! 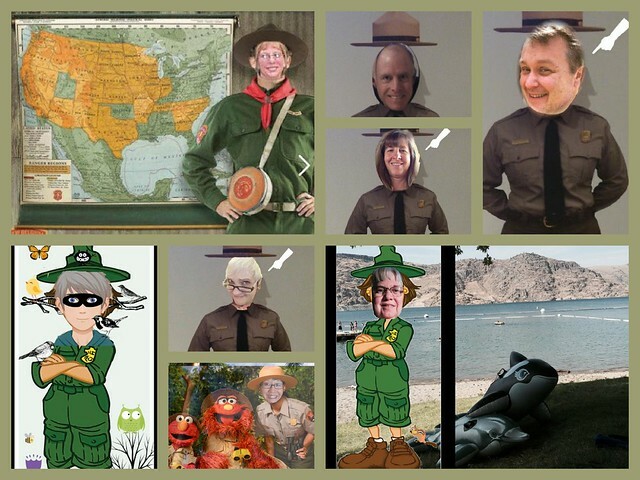 I am fortunate to have been asked to help facilitate the last Make Cycle of the Making Learning Connected MOOC with some new friends from the US National Park Service, which is nearing its 100th anniversary celebration next year. Together, we are asking participants and teachers alike to get outside and explore their local parks and open spaces, and reconnect to the world. Our main collaborative project this week is a map. Called GeoTag Your Space, we’re hoping that folks take pictures, shoot videos, write poems, or whatever inspired them, and that they come back to add a tag to the collaborative map. 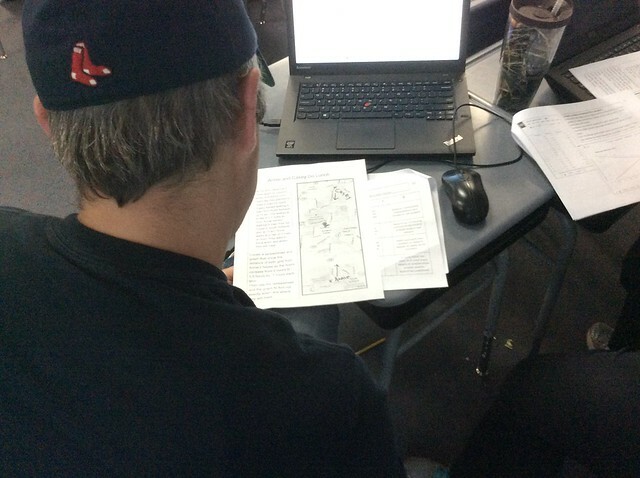 You go explore, too, and then come back to collaborate with us by adding your own pin and media to the map. Need help with pins and media? Here is a tutorial designed to help walk you through some of that. How about doing a RangerMe make project? Take this image (please) and add your face into the circle, and then share it out. 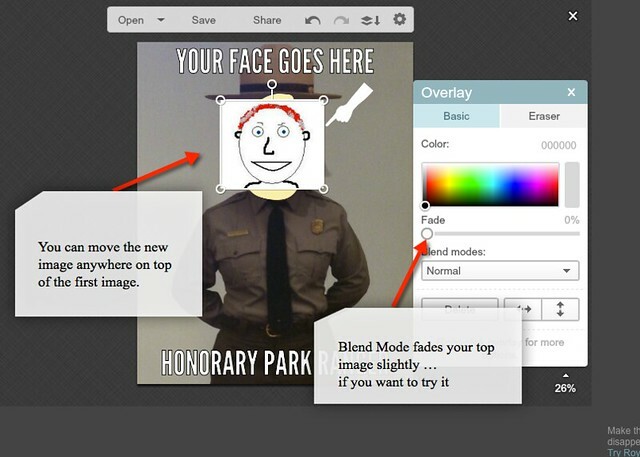 It will depend upon your operating system, but some folks are just using a simple photo editing program to grab their face from one image and layering it on this template. 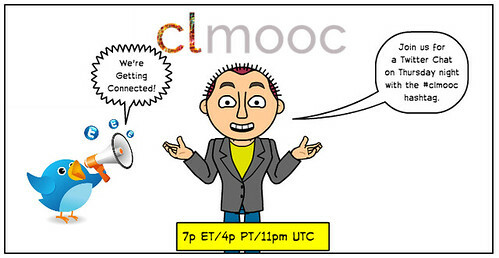 Join our Make With Me live broadcast with chat tonight (Tuesday, July 28) at 7p ET/4p PT/11pm UTC live streamed with a synchronous chat here at CLMOOC. This session will also be recorded so you can watch the archive later. 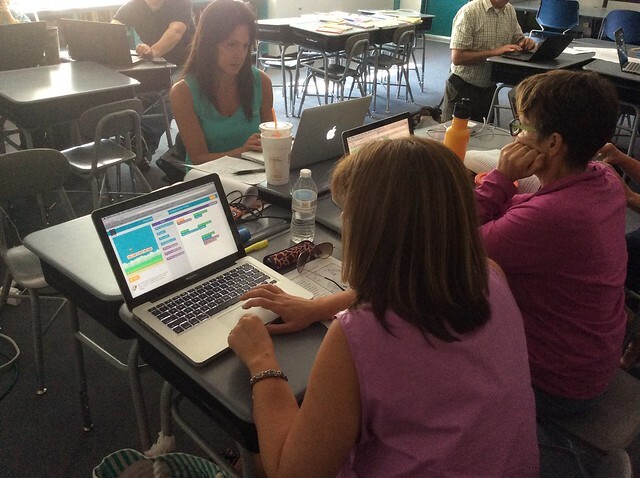 Last week, I facilitated a Digital Writing Marathon through our Western Massachusetts Writing Project. Part of the intent was to invite folks from various ongoing WMWP initiatives together to play and tinker and reflect on technology. I began by sharing the Gary Hayes Social Media Counter as a visual reminder of why we need to be at least considering the impact of technology on the lives of ours students. This sparked a discussion about the Media Lives of young people, and the important role that teachers play in helping students navigate technology. 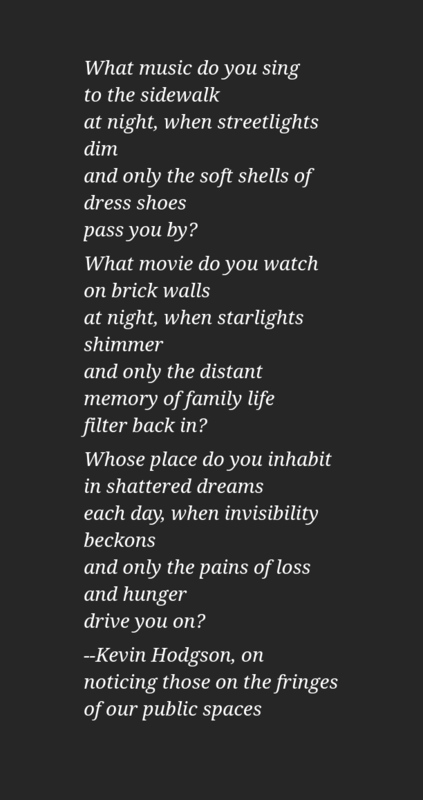 We then moved into some collaborative writing, and we riffed off the recent #celebrateteachers concept of teachers writing about educators who influenced their lives. I really love this kind of reflective writing, and we used a simple Google Slides format to collaborate together on a single presentation. Although nearly everyone in the marathon has Google Apps for Education in their school, very few have tapped it for its collaborative power, and this activity sparked some great conversations about possibilities for shared projects and more. From collaboration, we shifted into identity in digital spaces, and how best to help students think about how they represent themselves — and protect themselves — in various social spaces they use outside of school. I brought the group from the Digital Marathon into our Bitstrips for Schools space, and we spent some time making avatars to represent ourselves, and then shifted into how teachers might use online webcomic sites for engaging writers. 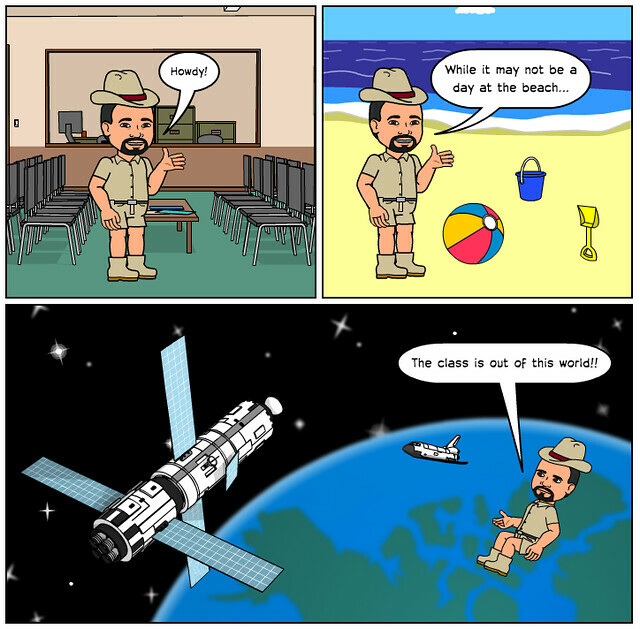 Bitstrips was a hit, with lots of laughter and making. I wrote about the next activity the other day, as a WMWP colleague led us through an activity that turned a math word problem into a Google Sheets learning experience and ended with a video essay format to check for understanding. We then moved into the world of coding and programming as literacy practice, and I introduced the Hour of Code and the Flappy Birds game activity that ends in the creation of a Flappy Bird game. I framed it as another way to engage students in technology in a meaningful way. This activity was sort of hit or miss, as some seemed to get bored with it or not all that interested in programming elements (whereas my students get highly engaged). Finally, I showed them Padlet as a place for exit tickets and reflection, and I asked them to leave some thoughts on technology and learning, and a few knew of Padlet, but many did not. The day went by quick, even for four hours of PD, and I think it had just enough balance of play and reflection to make a ripple in some classrooms this fall. PS — here are some extension activities I put in play for them. We never got to them, but they have our website to refer back to and share with colleagues. Want to Explore Other Avatar Sites? How about more coding challenges? 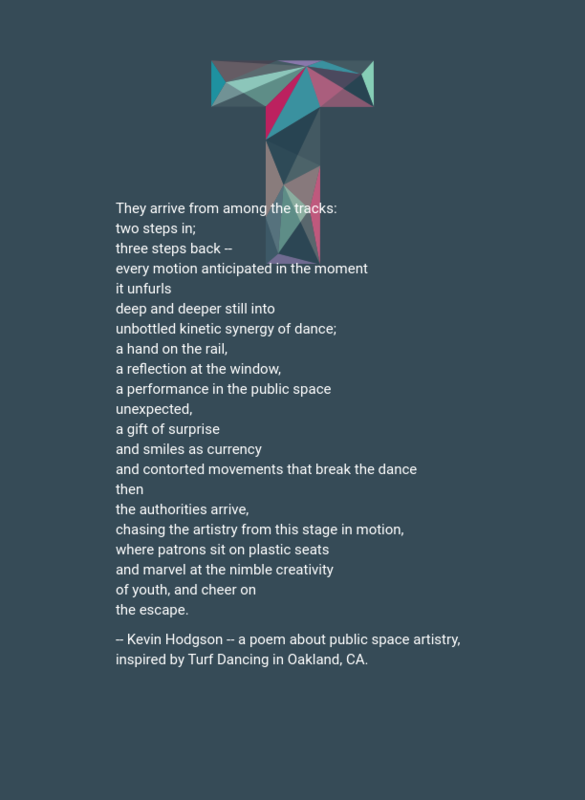 I seem to have left a few poems scattered here and there during the week’s exploration of public space via the Making Learning Connected MOOC, and I finally rounded up a few to pull together into a single post. 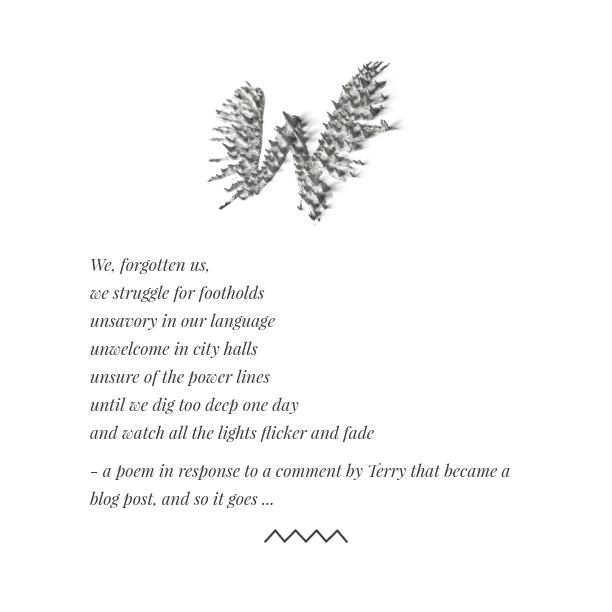 Two of the poems are about the voiceless in our spaces, and the third is the hacking of a public space for art. The notion that we are all in these spaces together becomes a theme for exploration. This is the third post in my inquiry around the Internet as a Public Space for the Making Learning Connected MOOC, and of course, I had to share out the views of Howard Rheingold, who has been exploring this notion for many years. This video (which he made for one of his college courses but then shares it with everyone else) is entitled: Why the history of the public sphere matters in the Internet age. I also invite you to talk back to Howard, via a Vialogues I have set up which allows you to annotate and comment as you watch the video unfold. I was the lead facilitator at a Digital Writing Marathon yesterday, bringing in folks from various groups of the Western Massachusetts Writing Project for a day of play, tinkering, making and reflection on teaching practice with technology. Our workshop purposefully dovetailed nicely with the ethos of the Making Learning Connected MOOC, too. I’ll share out some more of my end of the entire day in a future blog post but I wanted to share out a project that my WMWP Tech Team member Tom Fanning brought to us that really had us engaged. Tom led part of the workshop, fusing math, writing, and technology in a really interesting way. He had us creating short video expository essays to explain how we solved a math word problem using Google Sheets (ie, Excel) to solve it. Essentially, Tom laid out a math problem (two girls walking from two ends of town need to meet … where do they meet and when? 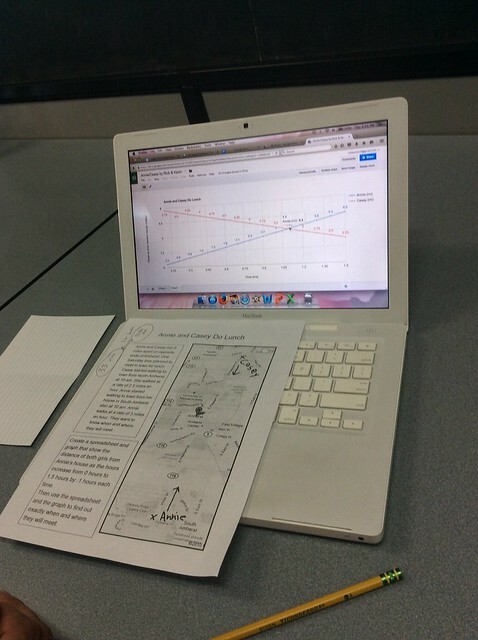 ), gave us some initial data points, and then proceeded to help us learn how to use Google Sheets to solve the problem. First, we did some data analysis, and then we turned our data into a chart that provided us with a visual of where the two girls would intersect. That information then helped us answer the questions of where and when they would meet. That was all interesting enough, particularly for the room of English and Science teachers not all that accustomed to crunching numbers and generating data charts. Tom then had us outline a “script” in which we had to explain our answer and our process to finding the answer, and use video to capture our thinking. Tom often uses this style of informal expository video capture as part of his work around digital portfolios (he shared a video of a student walking through some math strategies). The videos are rough, no editing needed, but are a perfect way to document understanding and voice in a meaningful archived way.